Safety innovations for all feeders – Never climb a ladder to fill your feeder again. The badass auger hooks onto most barrel feeders, allowing you to easily fill tripod feeders up to 13 ft high and eliminating the risks associate with carrying feed up ladders. Move any type of feed into any type of feeder. Whether you're feeding corn or pellets, the Badass™ Auger will handle it quickly, smoothly and quietly. Blower-based units create dust, noise and fumes. The unique auger design transfers feed smoothly and quietly. There is no need to mix gas and oil, carry fuel cans and wear yourself out attempting to pull-start the engine. Simply plug in the and push a button. At 39 lbs, it's light enough for anyone to handle. The heavy duty 12V electric motor is powerful enough to move any type of feed at amazing speed. Safety innovations for all feeders - Never climb a ladder to fill your feeder again. The badass auger hooks onto most barrel feeders, allowing you to easily fill tripod feeders up to 9 ft high and eliminating the risks associate with carrying feed up ladders. Patented technology - The Badass Auger features patented parts designed specifically for the Auger, making the auger low-maintenance. Replacement parts are available on our website for simple repairs. Unmatched efficiency - The badass auger loads corn at 100 pounds per minute. 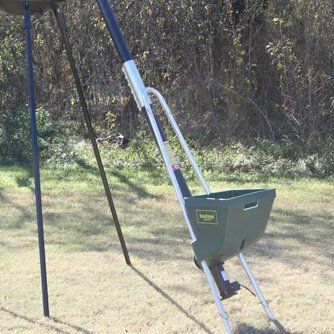 Fill a standard barrel tripod feeder in less than 5 minutes! Keep your feet on the ground - The Badass Auger allows you to safely fill tripod feeders without leaving the ground. Easily powered - The Badass Auger is powered by your standard 12v battery, eliminating the need for extension cords or power generators. If you have any questions about this product by Capsule Feeders, contact us by completing and submitting the form below. If you are looking for a specif part number, please include it with your message.